Picture this: a woman is sitting in a comfortable wooden chair, surrounded by a bunch of good old friends. On the table in front of her is a delicious-looking, and even more delicious-tasting, smoking hot meal. In between bites, she's laughing and exchanging with friends. Hours later, she leaves, smiling as she passes the door. She's had a great time in your restaurant. A few days later, she decides she wants to offer the same culinary and friendly experience to her brother for his birthday. She Googles the name of your restaurant, which pops on the first results page, to her satisfaction. But after spending quite some time searching through the various pages of your website, she lets out a sigh: there's no way to buy gift certificates on your restaurant's site. Disappointed, she promises herself that she'll swing by during business hours to buy one. But she's quite busy with work, and she's living a few miles away from your place. A few days pass and she forgets about her mental promise; she ends up buying a sweater to her brother for his birthday. And an ugly one at that. Sad story, isn't it? As a restaurant owner, in this story, you lose a direct sale, a few customers and maybe even a profitable relationship. The kind of stuff you don't want to lose, you know. Now I won't try to give you a full, boring lesson on how important an online presence is for today's restaurants (or any businesses, really). We're both living in the overly connected 21st century, and we both already know people search for what they want and need online, now more than ever. Being able to be found locally by nearby people on Google Maps, for instance, is crucial for a restaurant (here's an official how-to guide if you haven't set that up yet). But while "online" is essential, it isn't always cheap: a good-looking, optimized website will set you back at least a few thousand dollars. Still, most smart restaurant owners know its importance and won't compromise on its quality (or at least not consciously so). Many restaurant sites will go for a good design that conveys a similar feeling to the actual, real-life experience they offer customers. However, most of these websites aren't equipped with a de-facto gift certificate selling feature. It's easily understandable, considering how expensive the development of such a custom feature could be. That's where solutions like Snipcart come in. It will ensure 24/7 accessibility for the purchase of gift certificates for your customers. In other words, your online door will always be open, eliminating the possibility of losing a sale due to limited business hours. When done well, it will create a sales automation process that will save you and your staff some precious time (and money). It will allow you to collect interested customers' email addresses. You'll be able to add those in your newsletter and send them special offers, event promotions, personalized discounts, etc. A few months ago, La Planque, a Québec City (our home!) 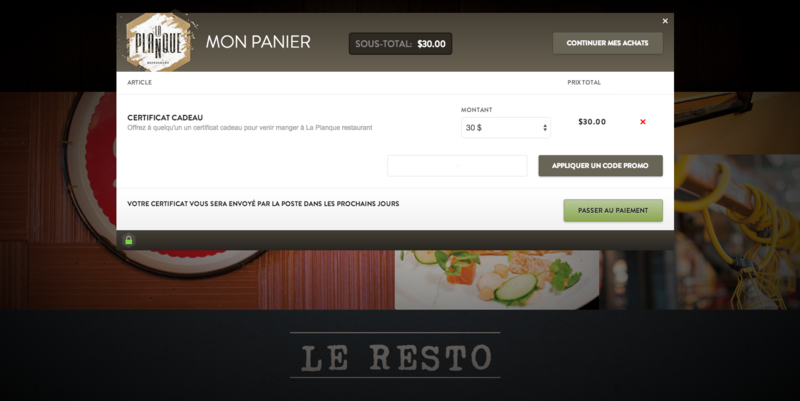 restaurant integrated Snipcart to their existing website in order to offer their gift certificates online. Since we already knew quite well the good folks who were taking care of their website (Option Design), the owners were presented with Snipcart as a potential solution pretty early in their research/decision process. They ended up choosing us. They got great feedback, and their Holiday gift certificate sales literally went through the roof (sure, our shopping cart helped, but the fact that their food, service and ambiance are off the chart helped even more). People bought a lot of those. Other restaurant owners, however, experience quite a different decision process. Before writing this post, I went through a simple role-playing exercise: I put myself in the shoes of a resourceful entrepreneur looking for a solution to this whole online gift cards issue. I Googled a few different relevant queries, then proceeded to evaluate the options the first and second results pages were offering me. It was a disaster: I won't point a finger and drop some names, but some of the offered "search-engine ranking" gift certificate solutions out there are straight up nightmares. Especially when it comes to design, customization and checkout flow. Don't go there. Please, don't. This quick exercise only strengthened my belief that a post such as this one had to be written and shared. Now let's dive into some details regarding the integration of Snipcart to your site. First off, I'd like to insist on one important fact: to integrate Snipcart to your website, you will need a developer. But don't worry; whether you've worked with a web development shop or an independent developer, they'll both be easily able to integrate Snipcart (we've built something powerfully simple, I promise). You've already invested in a decent website and are looking for something that can be quickly integrated with the existing site. You're building a new website, and you need a shopping cart solution that can be seamlessly integrated with it. Let's give you an idea of what the developer will have to do exactly. First, he'll add a specific script (a short piece of code) to your site. If you're familiar with integrating Google Analytics to a website, you might have an idea of how simple that is. Once this is done, he'll be able to turn any normal links on your website into a buyable button. This button will make our cart pop straight on your web page. To do so, he'll just use some simple product definition markup we've created. He'll put the "buy certificates" button where you want it, and all that'll be left to do is the actual cart design customization. If you want to collect customer emails, as we mentioned earlier, simply ask your developer to add a custom field to your checkout process. Here's how La Planque set up their buy button. And here's their cart in action. And that's it, really. It's quick, light, and flexible. I'm betting your developer will like it, a lot. No URL redirection: you know that annoying moment when the web address you're shopping on suddenly changes, and you get redirected to a new, unfamiliar address/page? Your customers don't like that (it's where most of them drop out of the checkout process, out of mistrust, mostly). With Snipcart, the cart will simply pop up on your web page. The user will be able to complete his transaction in the same homogeneous environment he started his experience in. An extension of your image: by customizing the cart, your developer/web designer will make sure that your branding and image stay consistent when the user switches between your website and the shopping cart. You're not adding an ugly "plugin" solution to your site experience here; you're integrating an elegant and seamless cart experience. Right now, Snipcart's default configuration is set up to handle physical sales (actual products being shipped). 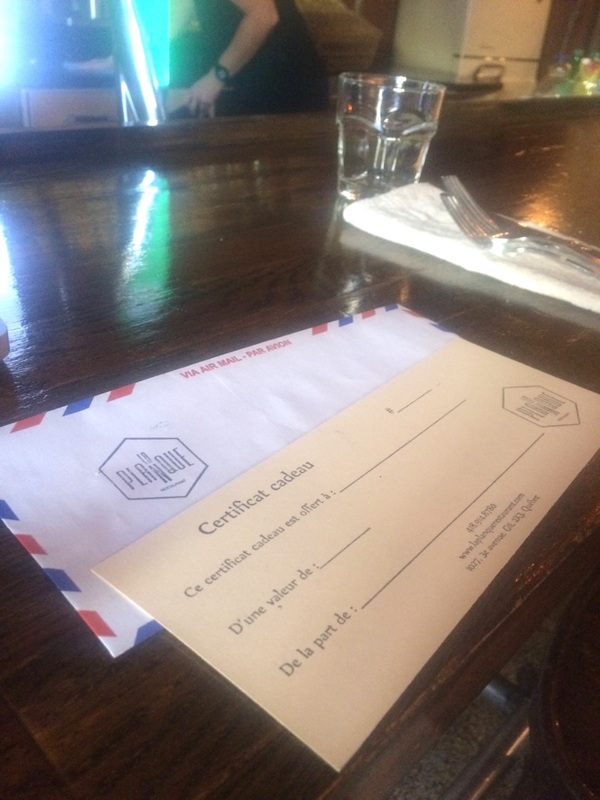 For restaurant owners who've invested in the design and conception of beautiful certificates, that won't necessarily be a problem: receiving a well-crafted "object" (as opposed to a printed sheet/gift code) can be part of a more compelling, stickier experience. However, we understand that, logistically speaking, having digital certificates shipped via email instead of a shipping carrier can simplify things a lot. As I'm writing these lines, our lead developer is working on a native digital goods feature for Snipcart. It should be rolled out soon, in a few weeks top. In the meantime, if you want to sell digital and printable gift certificates with Snipcart, it can still easily be done. To do that, your developer will need to use our webhooks. If you need a hand with handling that, just drop us a line at geeks@snipcart.com. You should treat your customer's online experience with as much care as you treat their experience in your restaurant. It's all about getting them what they want with as less friction as possible. 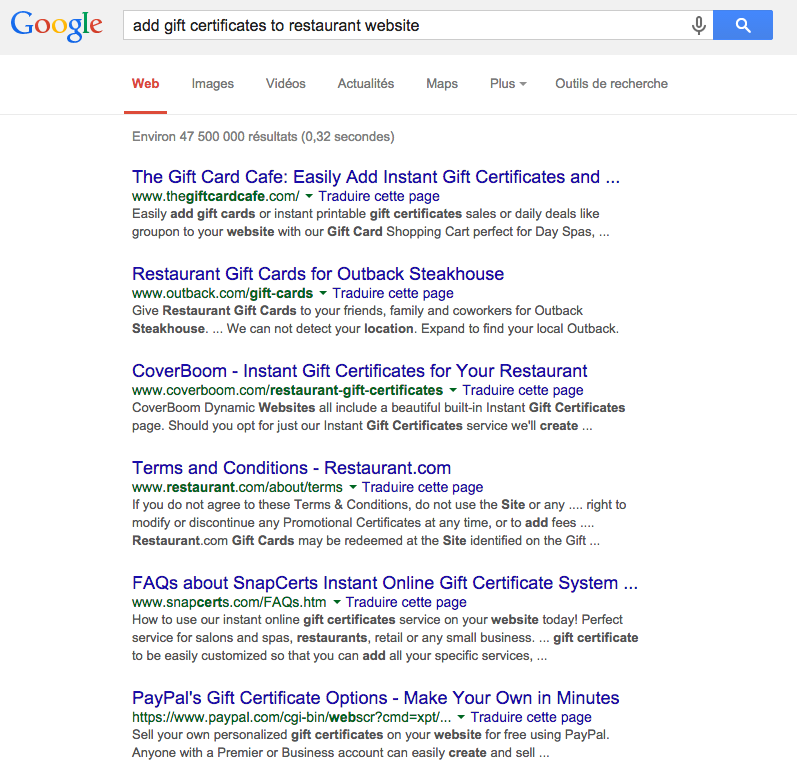 In this particular case, they want to be able to buy gift certificates from your website. Your job is to give them just that, and make sure they don't suffer through a clunky, annoying experience in the process. In the end, you'll be allowing your online customers to offer your awesome offline experience to whoever they want, whenever they want. Pretty cool, right? If you're interested in selling gift certificates on your website with Snipcart, you can either sign up for free here or shoot us an email if you've got any questions. P.S. : If you need a little inspiration, here's another example of a restaurant using Snipcart to sell cool gift cards online: My Rusty Bucket.